1.6 g beta alanine (CarnoSyn). Some days you're ready to take on the world, others you need extra inspiration to push through the paces. That's where pre-workouts come in. These power-packed powder kegs contain caffeine, amino acids, and other ingredients aimed at enhancing performance through a variety of different means such as increased alertness, sustained muscle endurance, and improved hydration status. With over 7 grams of active ingredients in a single scoop, POWDER BURN 2.0 is the spark to ignite your most explosive workouts. 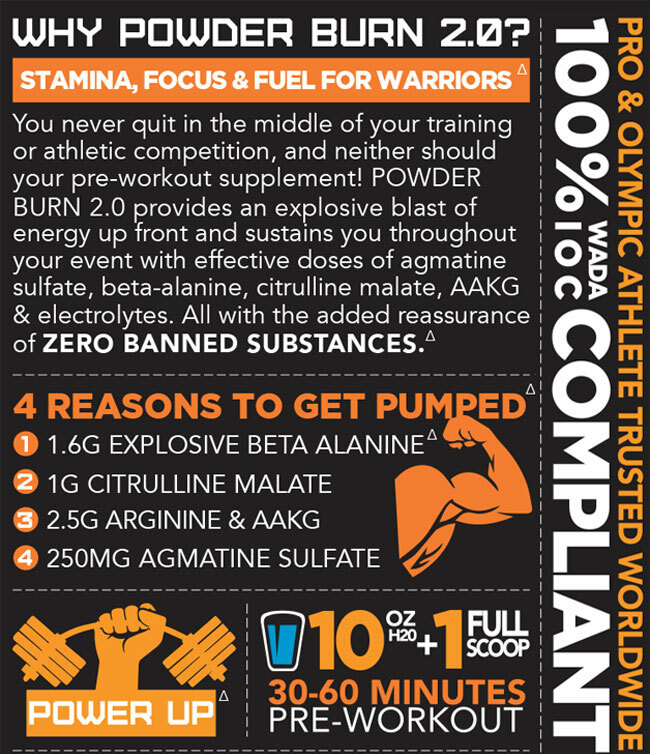 Unlike other popular pre-workouts, POWDER BURN 2.0�۪s formula is transparent so you can see exactly what you're getting: 2.5 g of arginine compounds; 1.6 g of beta-alanine; 1 g citrulline malate; 500 mg (each) of betaine, tyrosine, taurine, and agmatine sulfate; 200 mg of anhydrous caffeine; and ZERO BANNED SUBSTANCES!